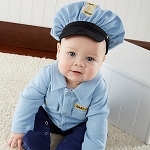 Presenting Signature Little Ones tip of the hat to the people who help bring babies into the world--and so much more! Inspire her with dreams of dedication, caring, and helping. When she wakes up in the morning, she'll be ready to operate! White, scrubs-style bedtime layette includes short-sleeved top accented with yellow band-aids, blue crosses, deep-pink hearts, a stethoscope around the neck and "Baby Nurse" embroidered on the left pocket, long pink pants, and pink surgical cap with white trim.